I’m forever trying to impress upon people — clients, students, people in line behind me at Benjamin Moore — the dramatic effects that light has on color. Yellow is one of the best vehicles for showing this. Because it’s a color that is so low in value, meaning it’s very light, it doesn’t have much tolerance for alteration of its true hue. Think of it this way: when you look at a paint fan, you see tons of reds/pinks, blues, greens, and oranges. However, you don’t see many true yellows; this is because when you add a little white, black, or whatever, it becomes muddy and often no longer recognizable as yellow. It turns gray, orange, green or brown pretty quickly when you start playing color scientist with it, and other higher-value colors don’t have that ‘problem.’ For example, when you put light yellow in a dark room it can easily turn muddy gray…or it can become xerox-paper white in a bright room. So, we can conclude that yellow is a very low-value color; don’t worry though, it’s still wonderful. Benjamin Moore’s Lemon Chiffon (932 or OC109) is one of those great yellows that is super subtle, but still retains a definite hint of color…in most lighting situations at least. The reason it has two different #s in the catalog is because it is both a “color” and an “off-white” according to the manufacturer. Still, I love its simplicity and its quiet nod to refined brightness. It pairs very well with vibrant oranges, pinks and yellows, and equally well with creams or golds. 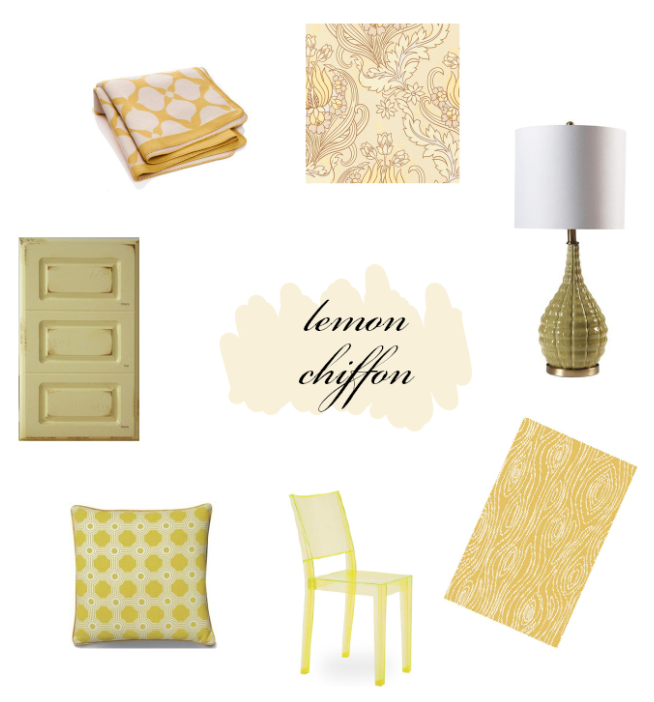 As always though, consult your testers before you choose a color: none of the spaces pictured above are Lemon Chiffon, but with the right kind of detective work you can achieve the same light lemony shades on your walls! Enjoy this week’s color collage which features light yellows from all over the spectrum, to complement the kind of pale yellow that your light will allow! Images clockwise from top: Graham and Brown "Temple Tulips" wallpaper (image via Graham & Brown); Contemporary yellow lamp (image via Furniture for Home); Shire Rug (image via Rug Market); Phillipe Starck La Marie Chair (image via Hive Modern); Lemon Gallaway Trellis Pillow (image via Weego Home); Cabinet in Lemon Chiffon (image via The Custom Shoppe), Jonathan Adler Throw (image via Jonathan Adler); and Benjamin Moore's Lemon Chiffon (932) in center. ← PANTONE’s 2011 Color of the Year is Honeysuckle!